but when I click OK nothing happens. I am obviously doing something wrong. The Associate dialog fails when you set the association just once via the Explorer method: Right click, Open with, Choose default program. Then Windows blocks the change of the associations by programs. This was done because some programs always changed the association to themselves when launched, although the user had changed it. So to change the association now, you will have to use the Explorer method also in Total Commander. I never use Explorer so that was confusing. Now I understand. I just upgraded from Win7 to Win10. When I doubleclick a jpg file in TC, it ALWAYS puts up a dialog that says "How do you want to open this file" followed "Keep using this app" (showing IrfanView), followed by a list of other programs. There is a checkbox to always use the selected program. Even if I check the checkbox, and stay with Irfan, it still asks me this EVERY time on a doubleclick in TC. I have associated Irfan with .jpg in the Win10 association panel (not just in Irfan itself). If I use Windows Explorer, Irfan opens immediately on a doubleclick without showing that annoying dialog. Other filetypes work fine in TC - e.g. 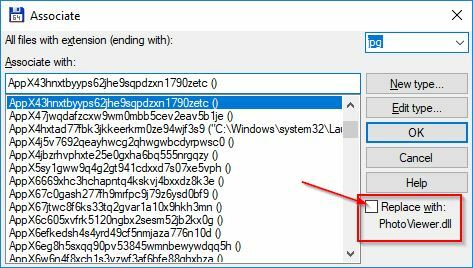 doubleclicking a .txt file opens my associated program without any dialogs. "Right click" -> "Open with" -> "Chose anoter app" -> select IrfanView -> "Always use this app to open JPG files" works fine here under Windows 10. Yes, that always worked for me, but the problem was that I could never get it to just open the jpg file in Irfan without my doing something extra (right-mousing as you describe; answering a question about using the default Irfan as I described above, etc). However, I see this morning that it is now working OK - a doubleclick opens a jpg in Irfan right away. Hmmmm. Seems like it needed a reboot (or a shut down?) in order to really get it set correctly. Anyway, I'm all set now. Thanks! No hope to get it fix on my PC, reboot did not help neither. This is intentional because the Photo Viewer app is faulty when called from programs other than the Explorer: You cannot switch through images with the next/previous buttons in this case. Although I have reported this bug to Microsoft a long time ago, it has never been fixed. Interesting... You are right... thanks.